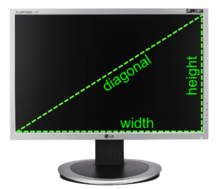 What is the Ubuntu linux command to find laptop monitor size? I want to know in inches if possible. It seems related to a bug in xdpyinfo. See also here. So if your ruler measures 30 centimeters, your screen is 11.811 inches. You can also use google with a query of the form 30 cm to in. Not the answer you're looking for? Browse other questions tagged monitor or ask your own question. Can I use my laptop as a second monitor for my desktop?